Egypt goalkeeper Essam El Hadary saved a penalty after becoming the oldest player ever to appear at the World Cup on Monday but it was not enough to stop the the Pharaoahs sliding to a 2-1 defeat by Saudi Arabia. 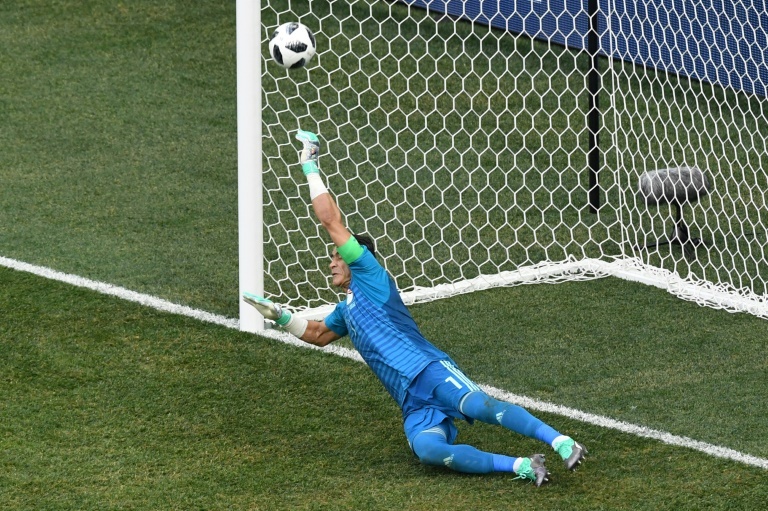 The 45-year-old goalkeeper flew to his right to make a spectacular stop in the 39th minute from Fahad Al Muwallad's spot-kick at the Volgograd Arena. "I'm really so happy," he told AFP after the match. "I'm the happiest person in the world to set this record." But El Hadary's joy was tempered after Saudi Arabia fought back from Mohamed Salah's superb opening goal to claim a consolation win. Both Saudi goals came deep into stoppage time in both halves, with Salem Al-Dawsari securing their first World Cup victory since a run to the last 16 in 1994 with the last kick of the match. "I can thank my teammates because they are the power that got me to the record but I'm really so sad on the other hand with the result," added El Hadary. Egypt still have not recorded a World Cup finals win in three appearances. Salah's strike was Egypt's first goal from open play at the World Cup since May 27, 1934, when Abdulrahman Fawzi netted in a 4-2 defeat by Hungary. It was second time lucky as Salman Al-Faraj took responsibilty for the spot kick and El Hadary could not repeat his heroics as the first-half clock ticked past 51 minutes. El Hadary made his debut for Egypt in 1996, a year before his Egypt teammate Ramadan Sobhi was born. He is older than three coaches at Russia 2018 -- Roberto Martinez of Belgium, Serbia's Mladen Krstajic and Aliou Cisse of Senegal. The Pharoahs captain lived up to his nickname of "High Dam" with two stunning saves from headers in the second half. But in the fifth minute of second-half injury-time, Al-Dawsari popped up in the box to beat El Hadary and secure a famous Saudi win.